The Tampa Bay Rays are 8.5 games behind the Boston Red Sox and New York Yankees. Having to replace the offseason losses of Carl Crawford and Carlos Pena in the lineup, the Rays have gone from third in the American League in runs last year to seventh this season. Their most recognizable star, third baseman Evan Longoria, is on pace for career-lows in batting average, on-base percentage, slugging percentage, doubles, home runs and runs batted in. Because Tampa Bay is so far behind the two best teams in the AL, their offensive decline and their star third baseman’s struggles, few have taken notice of the kind of season Ben Zobrist is having. Ben Zobrist did not reach the big leagues until age 25 in 2006. He didn’t play in more than 62 games in a season until Rays manager Joe Maddon made him an everyday player at age 28 in 2009. Zobrist responded to his first everyday starting opportunity in the majors with a .297/.405/.543, 28-double, 27-homer, 91-RBI year, finishing eighth in the AL Most Valuable Player voting. However, pitchers became more aware of Zobrist’s presence in the Rays’ lineup last season, pitching much more carefully to him. As a result, Zobrist’s numbers dipped badly to .237/.346/.353 with 28 doubles, 10 homers and 75 RBIs. His poor 2010 season is another reason he has kept under the radar this season. After whacking 28 doubles apiece in his first two full seasons, Zobrist leads the majors with 42 doubles this season. His .874 on-base plus slugging percentage (OPS) ranks him 10th in the AL, better than Robinson Cano, Dustin Pedroia and Mark Teixeira. The Rays are ninth in the league in on-base percentage (.317), but the lack of baserunners has not prevented Zobrist from knocking in 73 runs. He is on pace to drive in 93 runs, which would be a career-high. Zobrist is also batting .287/.375/.499, has slammed 15 home runs and darted around the bases for six triples. Look closer into his season, and Zobrist has only gotten better as it has gone along. For the first 55 games of the season (April 1- June 2), he hit .246/.325/.473 with 16 doubles, nine homers and 30 RBIs. In the 69 games since then, he is batting .319/.413/.519 with 26 doubles, four triples, six homers and 43 RBIs. Zobrist’s .932 OPS during that span would rank him seventh in the AL over a full season. Over the past month, he is hitting .360/.429/.604 with 13 doubles, one triple, four home runs and 24 RBIs. His 1.032 OPS during this span would be second in the AL behind Jose Bautista over a full season. He does not hit bash home runs, Zobrist’s value is fully displayed in OPS because he gets on-base at a high rate and gets many extra-base hits. The Tampa Bay Rays are looking at an uphill battle over the last month of the season to catch up to the Yankees and Red Sox in the AL East. After losing Carl Crawford and Carlos Pena this offseason, their offense has declined while their most talented player, Evan Longoria, is posting career-lows in every major offensive category. Those factors, along with his supbar 2010 season, are reasons why few seem to notice how great of a year Ben Zobrist is having. Tampa Bay’s second baseman/right fielder leads the majors in doubles and is 10th in the AL in OPS. 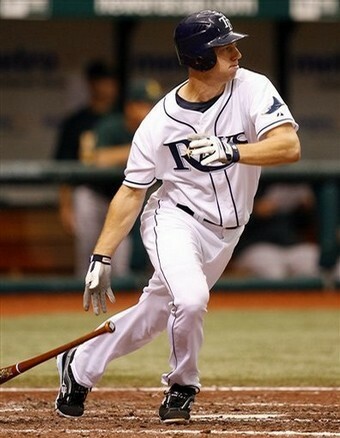 His penchant for getting on-base and smashing extra-base hits has only increased as the season has gone along. Ben Zobrist is having the best season that few are realizing.